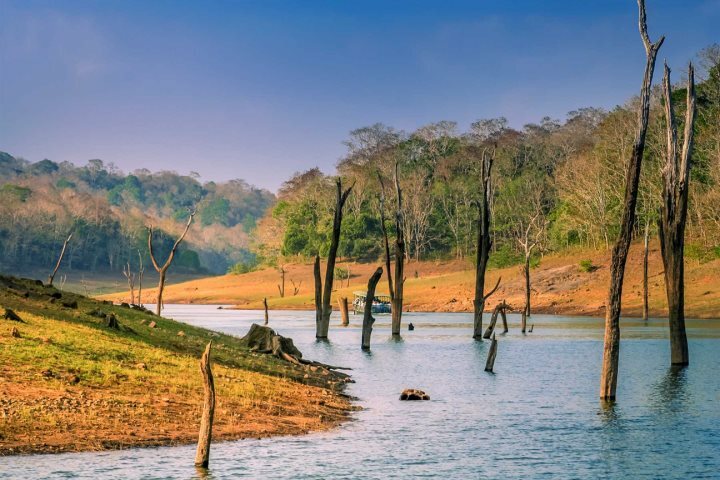 Kerala is one of the most beautiful states of India boasting golden beaches, lush green hillsides and a stunning network of palm-fringed waterways. The food is spicy and the people equally as warm and welcoming, eager to share with you ‘God’s Own Country’, as Kerala is fondly known. This is due to the Hindu myth that Kerala was created by Lord Parasurama, an incarnation of Lord Vishnu, who was believed to be creating land for his devotees in which to live in peace. Starting in the city of Cochin, here are my highlights from my first visit to this magical land. Made up of a group of islands, Cochin incorporates Willingdon Island, Fort Kochi, Mattancherry and Mundamveli. On Fort Kochi in particular you can see the myriad of Dutch, Portuguese, British and Jewish influences that make the city unique. Highlights include the Church of St Francis, India’s oldest European Church, the Santa Cruz Basilica and the Dutch Palace which was built by the Portuguese and presented to the Raja of Kochi, in 1555 AD. 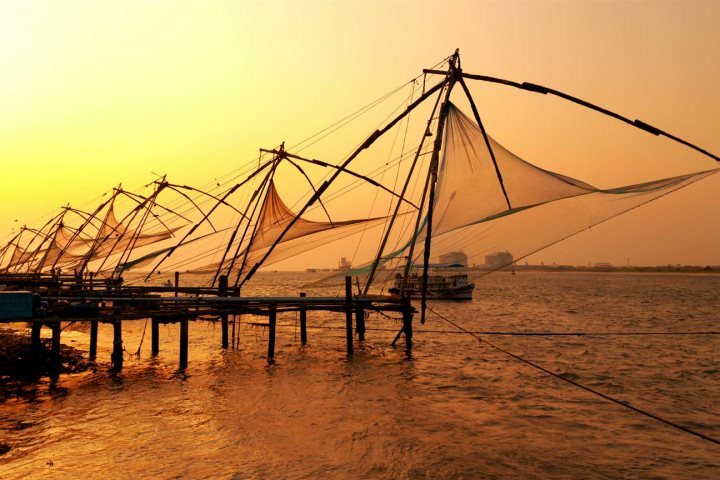 My favourite memory, however, is of the Chinese Fishing Nets at Fort Kochi. It’s hard to judge the scale of these vast fishing nets from photographs. Set up on bamboo and teak poles, they are counter weighted by large stones. Each net spreads out to around 20 metres over the ocean and is operated by a team of six. The weight of one man walking along the main beam is enough to lower the net into the sea. Four or five minutes later the net will be raised and the usually modest catch sold to passers-by. 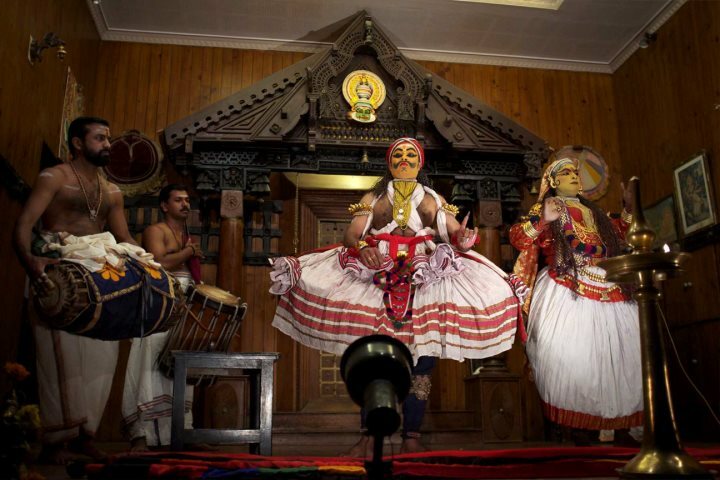 Kathakali is one of India’s classical dance forms which dates back to the 17th century, although many believe it is very much older. The all-male performers put on elaborate make-up, masks, headdresses and costumes, the art of which is all part of the performance. Through dance, a story then unfolds, with tales from Hindu epics of good versus evil with gods and goddesses, evil spirits, saints and animals. The colour of the face make-up is a guide to the charter being played - Gods have green faces and women have yellow faces, to name just two examples. 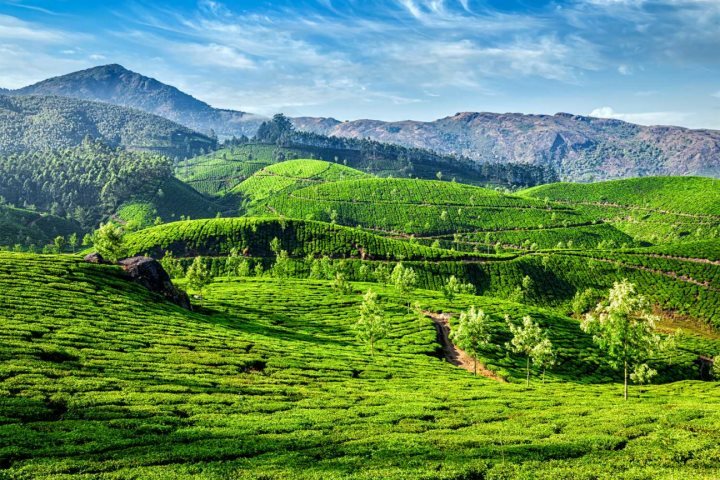 Discover how tea (chai), the most widely consumed beverage around the world, is picked, dried, sorted and graded, with a visit to one of Kerala’s tea plantations amidst the beautiful rolling green hills of the Western Ghats. India is one of the largest tea producers in the world, although over 70% is consumed by Indians themselves. The most famous of which are located in Munnar and are visited in our Discover Kerala Tour. The spice plantations, found in the same region, are also well worth visiting. Wander along the pathways as you breathe in the scent of cloves, nutmeg, cinnamon, or cardamom. The plantations are great places to pick up some edible souvenirs for your cooking pot back home, but you’ll also learn that many have great nutritional and medicinal value and that some are used by the cosmetics and perfume industries, while others are used as preservatives. This protected wildlife reserve covers some 777 square kilometres in the Pandalam and Cardomom Hills of the southern Western Ghats. Whether you explore on foot or by boat, it’s a magical place to visit. I’ll never forget the wild elephants I saw here as they came to the water to drink. Other animals that can be seen include bison, sambar, wild boar, langur monkey and, if you are very lucky, the elusive tiger. The beach resorts around Kovalam are famous for their Ayurvedic treatments which are visited as part of our Kerala in Style Tour. Ayurveda, meaning the ‘knowledge of life’ in ancient Sanskrit, is an ancient practice developed hundreds of years ago to promote harmony within the body. It is believed to boost the immune system, relieve stress, improve circulation, increase vitality, promote healthy skin and to remove toxins from the body - it’s important to shower after your massage to wash away the toxins that have been drawn from your skin which will otherwise simply be reabsorbed. I’ll never forget how a feeling of calm washed over me during my first ever experience of this massage technique and how energised I felt afterwards - so I for one won’t dispute the claims. The absolute highlight of my visit to Kerala has to be the time I spent on a rice boat, drifting along the lakes and rivers of the backwaters. Boats of every shape and size can be seen as you set off, but as you head further afield it isn’t long before the gently swaying palm trees that line the river banks are the only company you’ll have. The solitude is broken as you pass by a village where daily life is displayed before you. Children walk along the river banks or ride in a canoe on their way to school. A woman leans over the water washing clothes, while another is washing her children and yet another is fishing, hoping to catch something for the family’s lunch. Best of all? Waking up early to see the sunrise from behind the palm trees on the opposite bank to where we had moored for the night - a tranquil, magical moment I’ll never forget. 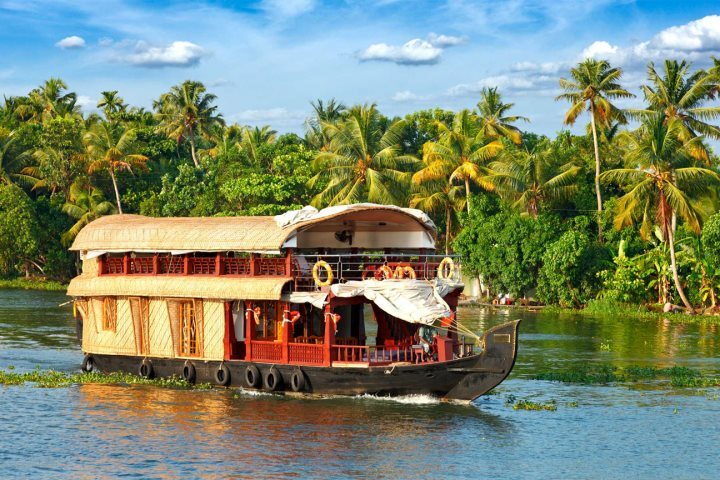 Let us tempt you to a visit to the beautiful state of Kerala in the southwest corner of India. Disocver more about our South India Tours. Katie, our Goa Product Manager, has also enjoyed getting to know Kerala and is eager to share it with you. Look out for more articles about Kerala from Katie over the coming months.